Get more of the Starbucks coffee that you love! 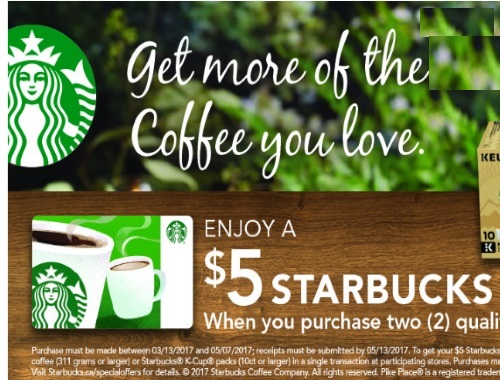 Enjoy a $5 Starbucks Card eGift when you purchase two qualifying Starbucks products! 1.Purchase qualifying Starbucks item(s) between March 13 - May 7, 2017, and star/check the item(s) and the date on your receipt. 2. Snap a clear photo of the entire receipt with your mobile device or phone. 3. Email your photo to rewards@starbucksgiftcard.ca. Please allow 48 hours for processing. 4. After your photo is submitted, you will receive an automatic confirmation and request to complete a registration form. Please note this the $5 Free Gift Card is USD funds so when I transferred the amount to my card on April 13 I actually got $5.71 CAD!